Yao Lin, Associate Professor of Chemistry in the Polymer Program of the Institute of Materials Science, has become very passionate about chemistry and polymer science—and about encouraging intercontinental collaboration on it. With a background in chemistry, polymer and molecular biology and a degree from Fudan University, China, Dr. Lin is interested in researching bio-inspired materials for the future and developing educational opportunities for students at home and abroad. Dr. Lin and his lab are currently working on two projects which mimic certain natural protein polymers and complex enzymes to create synthetic, bio-inspired materials. One direction is trying to understand the cooperative folding and interactions between complex macromolecules containing synthetic polypeptides to mimic the dynamic process of protein polymerization. According to Dr. Lin, the protein polymerizations provide the filaments with excellent mechanical strengths for our muscles, our cells, and contribute to cell movement. The reason cells can move is partially because these protein fibers can grow on one end, and shrink on the other end. The other direction involves mimicking an enzymatic structure that forms “teams” that can degrade cellulose into sugars. When bacteria develop complex structures like nano-machines that recruit six to ten different types of enzymes into a team, they can work much more effectively than individual enzymes. 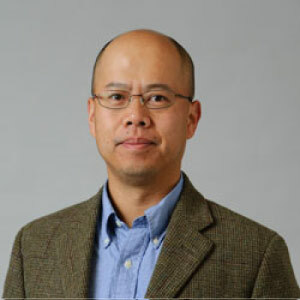 Dr. Lin and his group are researching whether they can replace that type of protein scaffold with synthetic polymers, and thus design the chemistry at interface between these polymers and proteins. This will allow them to recruit different engineered proteins in an organized manner. “We are trying to understand if we can encourage some kind of synergistic actions between these enzymes, and eventually, whether we can build up some kind of nano-machines,” Dr. Lin explains. He imagines making something like “nanospiders” that can move on the cellulose surface and degrade the polysaccharides when they are moving around. As a high school student in China, Dr. Lin had to decide his major before applying to college, as students generally did at that time. Dr. Lin received an early offer from Fudan University, because of his good performance in the Physics Olympiad. “I was 17 years old, and I didn’t want to take physics because that was my dad’s major,” he explains, “but I wasn’t very interested in chemistry back then.” However, one of his family’s friends, who was a polymer scientist, highly recommended the interdisciplinary subject. “He gave me a lecture about plastics and rubber, and convinced me that the field has a very bright future and my interest in physics would also pay off. Indeed, I became more and more interested,” Dr. Lin says. Fudan University has a big chemistry and polymer department with faculty from very diverse fields, which presents an excellent opportunity for collaboration. Through an exchange program Dr. Lin initiated, UConn chemistry students can study abroad at Fudan University in China while Fudan students can carry out research at UConn during the summer. “China is still a developing country but they invest a lot of money in research. Particularly, the research in chemistry and materials has made very rapid progress in the last two decades. Our students will be able to learn something new there, on the other side of the earth. I was a student at Fudan and I also understand how important it is if you bring students abroad to the U.S. for a couple of months. It is a mind-opening experience,” says Dr. Lin. This idea is what motivated him to begin a summer exchange program for undergraduates between Fudan University and UConn. The program, which became official in 2012, has been running for three years so far and got renewed very recently. This exciting program is very constructive for students and faculty from both universities because, in addition to hosting exchange students, they host joint symposiums on specific topics, visiting scholars, and Fudan University has invited Chemistry and IMS faculty to give short summer courses for their students. Currently there are six chemistry students who have visited Fudan, and twelve students from Fudan have visited UConn. “What better collaboration to engage in than with one of the top-ranked schools in China? Excellent undergraduate students from Fudan have been engaged in summer research in Storrs, and the first ones have now become graduate students here,” Chemistry Department Head Christian Brückner said. Professor Brückner believes chemistry and science in general thrives on collaborations. “No institution possesses all the expertise to be able to compete alone in the modern global science world,” he says. “Right now, we would like to bring it to the next levels. For example, we hope we can initiate long term collaborations in selected research directions. And we want to get the graduate students involved in the exchange.” There are activities encouraging student collaboration between the universities, and the faculty publish joint papers with the visiting students, but there is limited collaboration at the faculty level. Dr. Lin believes this can only be driven by the faculty.